As part of their massive world-shifting story-arch known as The New 52, DC Comics have created a mini-arch known as Forever Evil. What would happen if all the world’s superheroes one day simply… vanished? Answer: The super villains would take over! 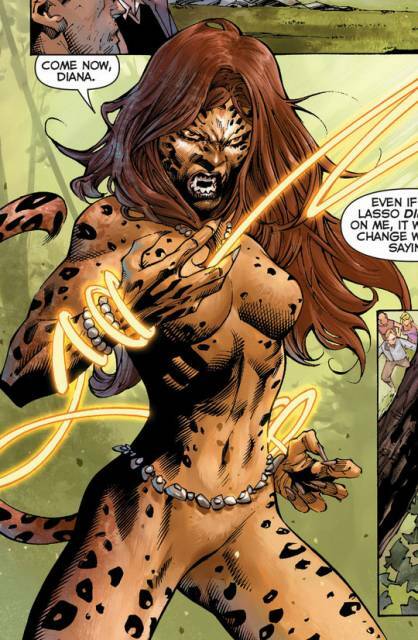 Among those villains, of course, are several well known anthropomorphic ones, including Gorilla Grodd (who often goes up against The Flash) and the Cheetah (sworn enemy of Wonder Woman). Each villain will be getting their own issue to shine in as part of this big comic book extravaganza. Look for them at your local store starting in September. (Specifically, Gorilla Grodd in The Flash #23.1, written by Brian Buccellato with art by Chris Batista; and the Cheetah in Wonder Woman #23.1, written by John Ostrander with art by Victor Ibanez). I'll have to keep an eye out for that.